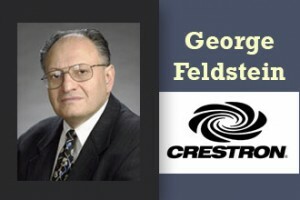 Today, Crestron founder George Feldstein passed away at the age of 73 after a battle with brain cancer. By the time he was featured in Forbes magazine as a “Made-In-America” success story, everyone in the AV industry already knew who George Feldstein was. Even the word “icon” to describe George Feldstein doesn’t go far enough to describe his impact on the AV market and beyond. Although he was known for his AV inventions, he worked on projects including a new type of dehumidifier to waterproofing, well, everything. George, a relentless tinkerer, was always inventing — he holds 14 patents (many of which Crestron itself uses). He once told me he was working to perfect the ceiling fan so it didn’t wobble and make that clicking noise everyone hates about them. He was also awarded InfoComm’s Adele de Berri Lifetime Achievement Award, as well as CEDIA’s Lifetime Achievement Award, among many other industry honors. George was certainly one of best known in the 80-some year history of the audiovisual industry. He popularized control of commercial meeting rooms, classrooms and residences with the Crestron brand. George started Crestron back in 1969 and didn’t hire his first employee until the mid-1970s. The company wasn’t making control gear back then but, by the late 1980s, it had become a huge brand as control of AV systems became its primary market. By 1990, it had well over 100 employees and, according to Forbes, generated about $5 million in sales. The rest is history. Creston, employing more than 2,500 people, is likely close to a $1 billion company now, although its privately held (owned 100 percent by George and his family) so sales are not officially known. Everyone from Microsoft to Sony is rumored to have tried to purchase Crestron in the past five years, though George has always said he would never sell. He officially retired earlier this year, tapping longtime Crestron #2 Randy Klein to take over as president and CEO, though we would guess he could still be found on the grounds of Crestron, thinking up new products and tinkering away with other engineers. We send our condolences to the Feldsteins, as well as the extended Crestron family for their loss. It is one that will be felt throughout the entire industry. Crestron has issued the following statement: It is with great sorrow that we announce the death of Crestron’s Chairman and Founder, George Feldstein. After a brave battle with brain cancer over the past year, he passed away earlier today, peacefully at his home surrounded by family. His passion and love for our industry was evident in everything that he did. His influence has left an indelible mark on all those who were fortunate enough to know him. He was truly a great man and a great leader. We will all sorely miss him, but his spirit will live on in all that he touched. This entry was posted in AV Industry News. Bookmark the permalink.